These were InstaPotted limas but they spent a good long time on slow cook after the lid was lifted. Basic cornbread muffins on the side – I dithered about adding a sprinkle of cheese in the batter and ended up going without that flourish. 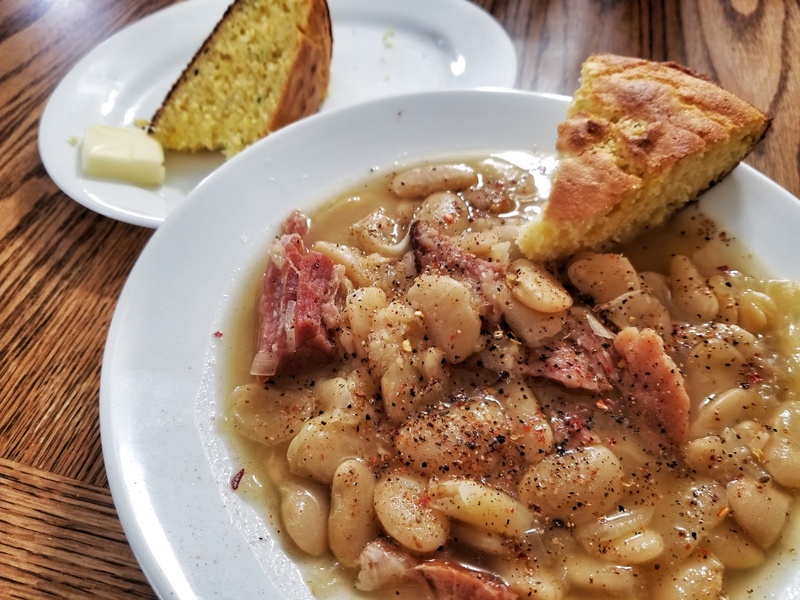 I was hit with a need for lima beans and cornbread and didn’t want to wait overnight to soak them properly so I turned to the pressure cooker. I cheated a little – bringing them to a boil and then resting them for an hour before sealing the pot and giving them 40 more minutes under pressure. Plenty of comment on the best method for pressure cooking dry beans, I saw many mentions of exploded looking beans from letting off the pressure too quickly along with a few predictions of foaming and overflow unless you add a little vegetable oil to the beans or fill the pot only half full, or less. Many sites have time tables for cooking various beans, I’ve found that my tastes run towards adding a little time to most everyone’s recommendations. Mine turned out mostly OK, they may have only needed 30 minutes given their head start. The buttermilk cornbread turned out pretty good though the bottom scorched a bit while on the stove top waiting for the toaster oven to come to temp. I like to pour the batter into a hot skillet to give it a proper crust, got distracted rinsing out the bowls and let it go a wee bit long on high. Two of the burners on the new stove put out much more heat than any of the burners on the previous range and I’m still adjusting. Nothing special about these, I will note that I used the “boil for a minute and let sit, covered, for an hour” method rather than soaking overnight. It worked fine. You drain the beans after the hour and then cook to your regular recipe. These are cooked in chicken stock with carrots, celery, and onions that were sauteed briefly. I like to add a Creole/Cajun seasoning to mine, and a couple of bay leaves. 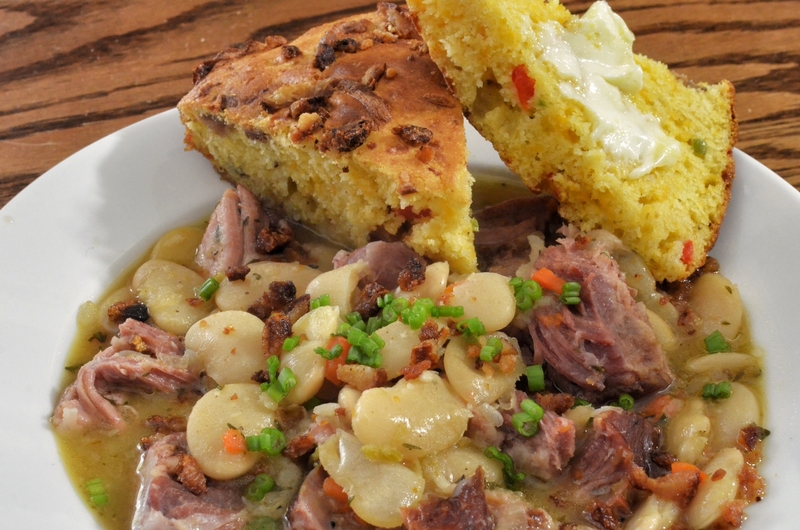 These have ham chunks that simmered in stock while the beans soaked to get a head start. The cornbread isn’t anything fancy, just the back of the box recipe. We made a run up to a local meat processing place a while back. It’s just a tad too far away to make spur of the moment purchases or to include in weekly grocery runs. We take coolers up there when we go and plan on filling them up with various items. 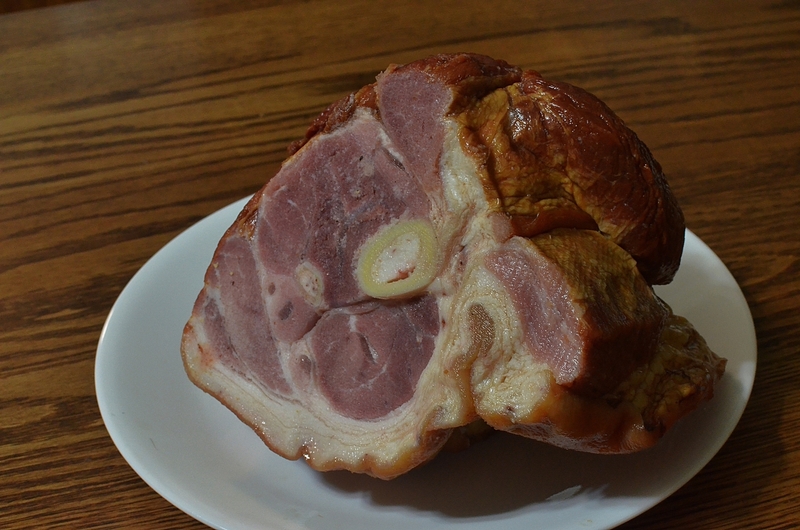 One thing they offer that just puts Kroger’s meat section to shame are their smoked ham hocks. This is half of one. They brought out two whole hocks and asked if we wanted them cut down. Yes, please! They are cured and just lightly smoked. I boiled this one for almost three hours so I could break it apart with a pair of forks. I cut the rind into lardons and crisped them as bacon and used those crumbled crisps and the rendered fat in the cornbread. 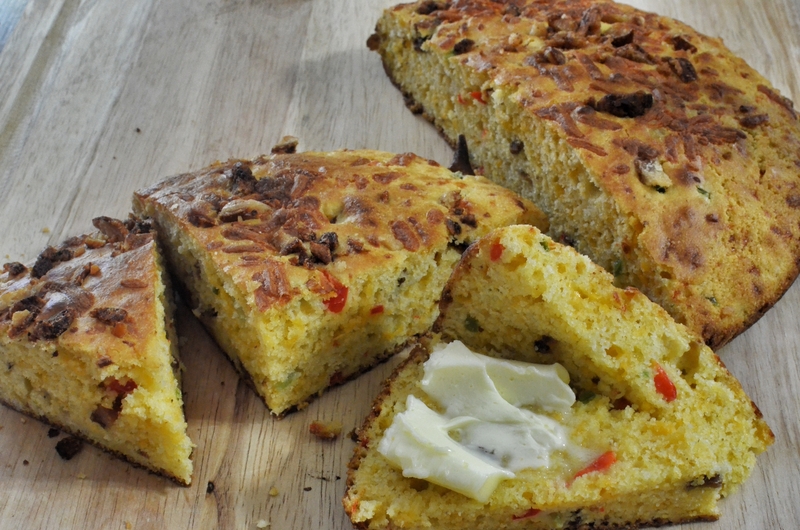 This is the standard back of the box cornbread recipe, with chopped peppers and a handful of shredded cheddar to go with those bacon-y crisps. Recipe for the beans? This one is pretty good! The minced veggies add a bit of color and the seasoning suggestions are on point. Not much to this dish. 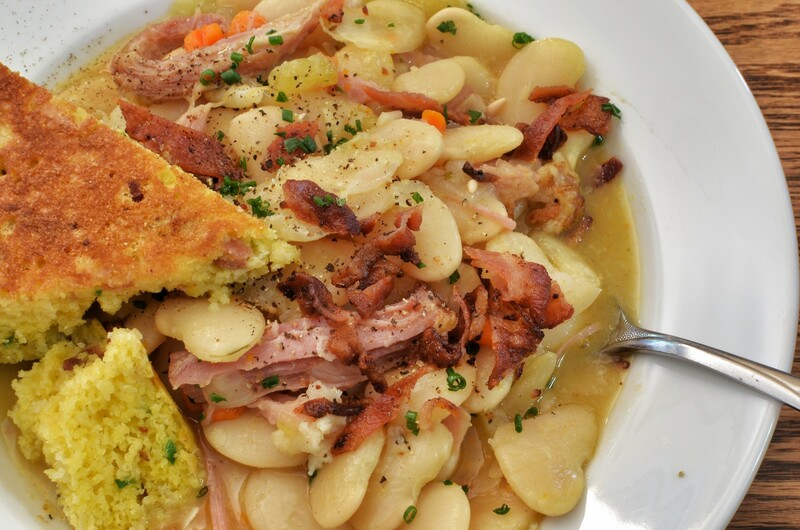 We had the butterbeans and cornbread leftover from the other day. A quick saute of some kale in bacon grease and chicken stock and this was a done thing. We cooked a half dozen slices of bacon and set them aside to drain, then added a couple of minced garlic cloves and a little diced onion to the fat, gave them a minute to flavor the pan, and then dumped in the kale. Separate the tough stems and rough chop or tear the leaves. I tossed the greens a little to coat them with the bacon and then added a half cup of chicken stock and covered the pan. Let the kale tenderize in the steam for five minutes then uncover and toss until the liquids evaporates. 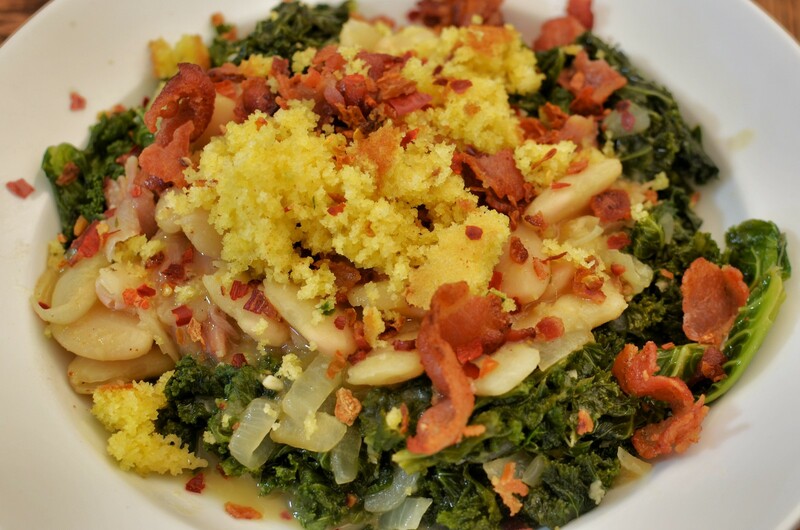 I ladled the warmed over beans onto a bed of the kale and crumbled the crisp bacon and the cornbread over them. I squeezed a lemon into the kale to add a bright note but that is optional. A cool front came through and dropped the temps from the 90s yesterday into the 70s today. 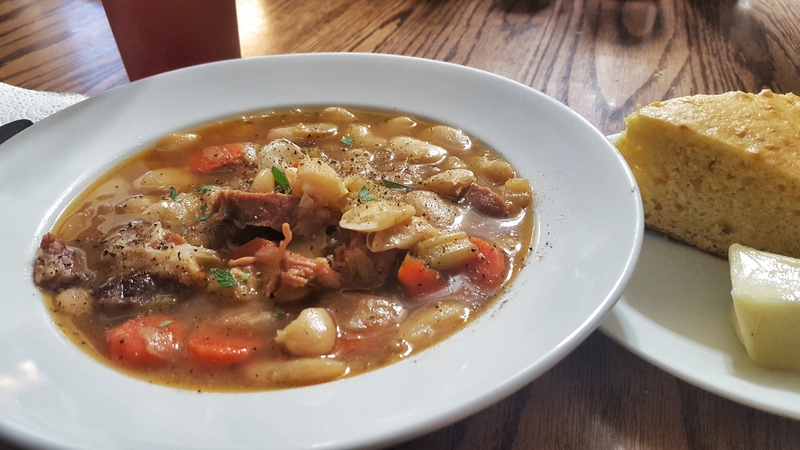 When I saw the forecast yesterday I knew that soup would work great for the menus today. I soaked these large lima beans overnight and started them simmering in a big pot this morning. I sifted through the results on a quick search and settled on this recipe to work with. Turned out pretty good! I departed from the recipe only slightly, using water and chicken seasoning paste instead of stock. The teaspoon of Creole seasoning wasn’t something that I would have thought of for this dish but it worked nicely in there. 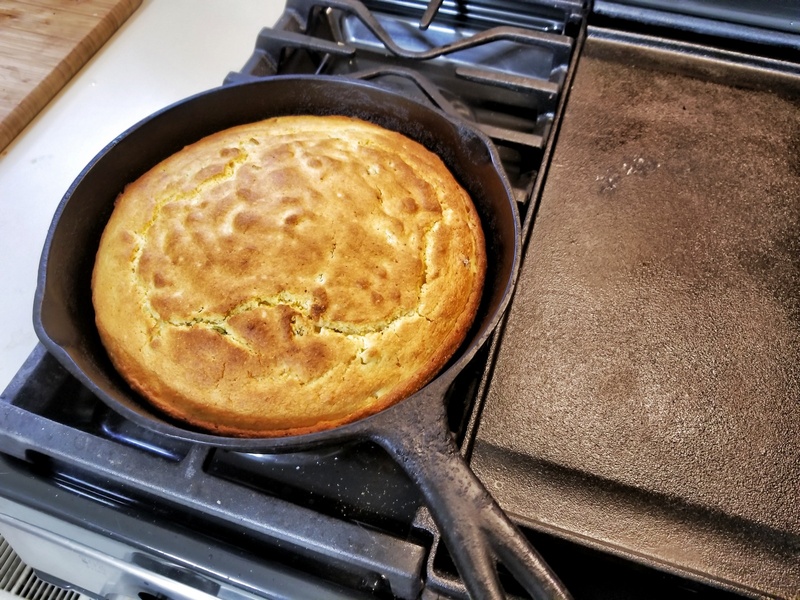 I went with a bacon and jalapeno corn bread using the recipe off the corn meal box and preheated the cast iron skillet to get that nice crust. It spent 20 minutes in a 400 degree oven. Spent several hours mowing today so I needed something that would be good on a long simmer. 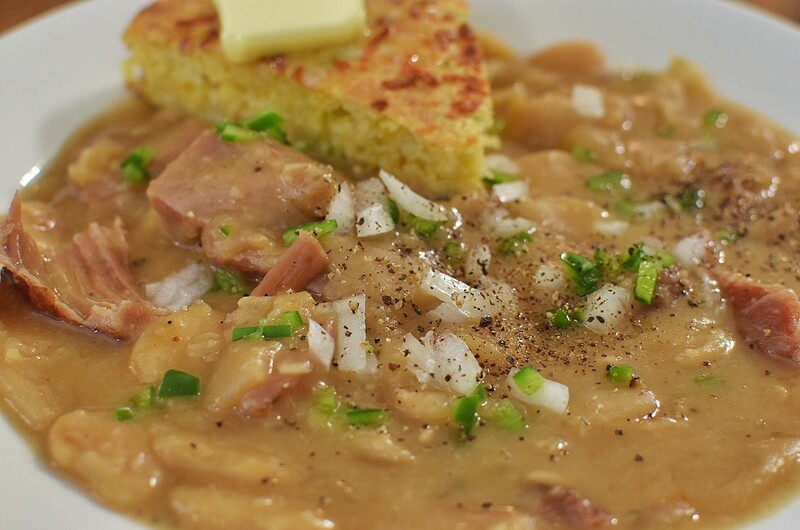 These large lima beans soaked overnight then simmered in chicken stock for almost too long. 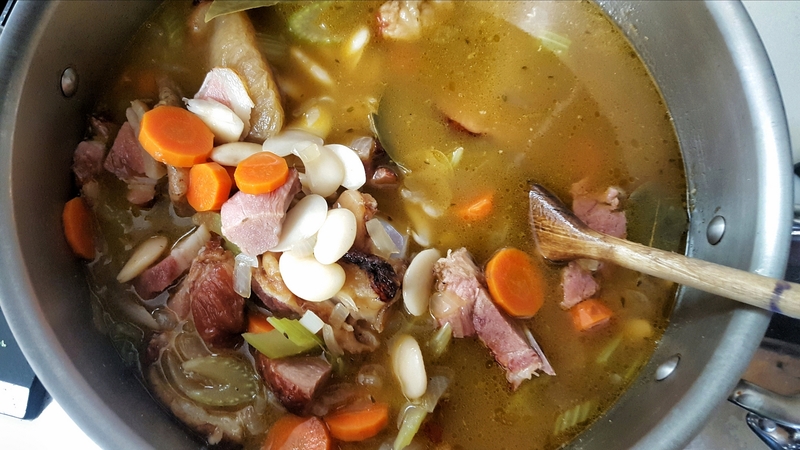 There’s a large Vidalia onion chopped up in there, and some of the cured pork pieces we keep on hand in the freezer just for bean soups. That meat processor we make a morning out of visiting keeps odds and ends of cured pork in big bags and we pick up a couple everytime we go. 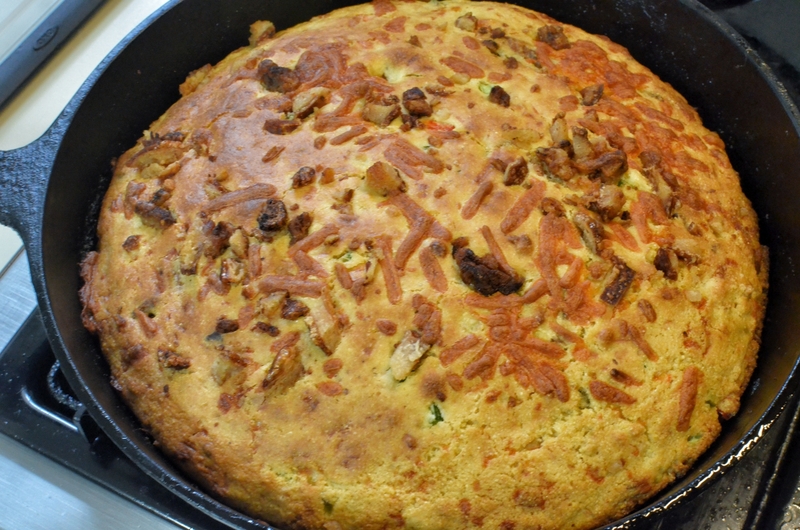 The cornbread had minced jalapeno and shredded cheddar added to the basic back of the box recipe, and the bowl is garnished with more jalapeno and minced onion. Mrs J swears these are not lima beans because she doesn’t like lima beans. She likes these, though.